134 Post-poned August 1936 to the orphans at the house at Toledo. Seventy large bouquets were taken to the sick in the Grinnell hospitals or residences. Ninety pieces of literature were distributed. 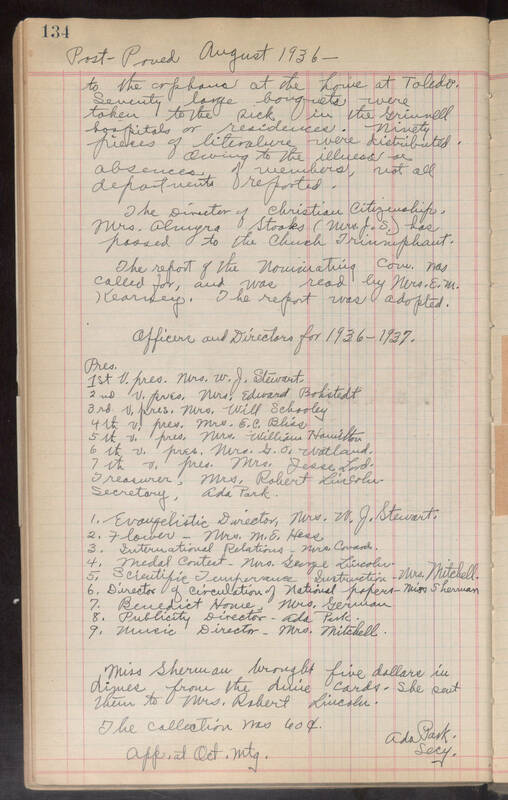 Owing to the illness or absences of members, not all departments reported. The Director of Christian Citizenship, Mrs. Almyra Stoaks (Mrs. J. S.) has passed to the church Triumphant. The report of the Nominating com. was called for, and was read by Mrs. E. M. Kearney. The report was adopted. Officers and Directors for 1936-1937. Pres. 1st V. pres. Mrs. W. J. Stewart. 2nd V. pres. Mrs. Edward Bohstedt 3rd v. pres. Mrs. Will Schooley 4th v. pres. Mrs. E. C. Bliss 5th v. pres. Mrs. William Hamilton 6th v. pres. Mrs. G. O. Watland. 7th v. pres. Mrs. Jesse Lord. Treasurer, Mrs. Robert Lincoln Secretary, Ada Park. 1. Evangelistic Director, Mrs. W. J. Stewart. 2. Flower-Mrs. M. E. Hess 3. International Relations-Mrs. Conard[?]. 4. Medal Contest-Mrs. George Lincoln. 5. Scientific Temperance Instruction-Mrs. Mitchell. 6. Director of Circulation of National papers-Miss Sherman 7. Benedict House, Mrs. German 8. Publicity Director-Ada Park. 9. Music Director-Mrs. Mitchell. Miss Sherman brought five dollars in dimes from the dime cards. She sent them to Mrs. Robert Lincoln. The callection was 60c. Ada Park. Secy. App. at Oct. mtg.